Audi has drawn up blueprints for a wider range of high-performance electric cars to help it take on German rivals and U.S. firm Tesla Motors, according to sources at the carmaker. Tesla has managed to stay ahead of the pack with new technology, which has extended driving range and reduced costs. Its success and the excitement about BMW's new "i" electric series have caught the attention of Audi, which some analysts have said risks looking like a laggard in an industry where innovation is a major draw for customers. Audi, a unit of Volkswagen, is about to launch its first purely electric car, a battery-powered version of its R8 supercar, which is due to hit European dealerships in 2015. It will offer a driving range of 450 km (280 miles), close to the 502 km of Tesla's top-selling Model S luxury saloon. Meanwhile, Audi has scaled up its electric car plans, having devised blueprints for several high-performance electric saloons and sport-utility vehicles, two company sources told Reuters, asking not to be identified because the matter is confidential. VW declined to comment. Audi did not return calls seeking comment. The manufacturer has shown various hybrid and purely electric concept cars since about 2009, but the latest blueprints stand a bigger chance of getting the nod for production after it lately overcame range limits. "Germany's major carmakers all have their electric car plans ready in the drawer," Hanover-based NordLB analyst Frank Schwope said. "They want to be prepared when demand accelerates," he said. The sources at Audi did not specify how many models were being planned or the scale of any production plans. 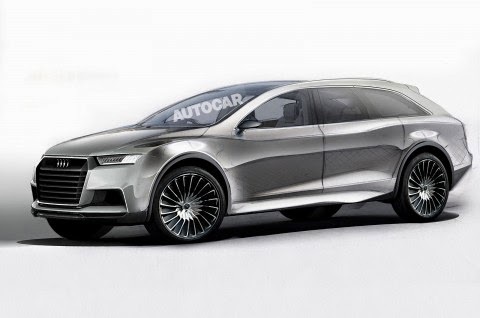 They said, however, that one of the blueprints is for an electric version of a new Q8 SUV that would pit the brand against Tesla's forthcoming Model X. Audi has defined a range target of about 400 km for any future electric model it aims to develop, the sources said. Audi's plans will be helped by steps underway to upgrade a production platform dubbed MLB that already underpins larger models across the VW group, such as the Audi A8 saloon and Porsche Cayenne SUV, and would cut costs for electric cars. Sales of electric cars are expected to surge to 2.7 million globally by 2018 from 180,000 last year as more models come to market, battery costs fall and the number of charging stations grows, according to business consultancy Frost & Sullivan. While mid-market battery cars such as the Renault Zoe and Nissan Leaf have missed sales targets, there has been more buoyant demand for premium offerings. Germany's three leading luxury carmakers are all advancing on the electric market. Rival BMW has launched its "i" series of electric models, including a 34,950 euro ($47,400) city car, while Mercedes, whose parent Daimler owns a 4.3 percent stake in Tesla, started production in April of its B-Class electric compact. Tesla has devised innovations that have cut the cost and raised the safety of battery packs. Its models also recharge more quickly than those of rivals, thanks to its connectors, software and efficient power management. But the California-based company is now facing its own challenges related to scaling up further after its success. It said last week it would share its patents with competitors in hopes of speeding up development of electric cars across the industry. Tesla executives have also met counterparts from BMW to discuss ways to promote electric cars which analysts say must include steps to create a common infrastructure and share the cost of building recharging stations. Audi's electric-car moves highlight a change of tack at VW. In 2012 Audi shelved the R8 e-tron at request of its parent as efforts to expand the model's driving range had stalled at only 215 km. Audi, which has since swapped R&D chiefs, has overcome the range limits by increasing the efficiency of the electric drivetrain and curbing on-board power consumption, development chief Ulrich Hackenberg has said. "Electric mobility is a key focus of our development strategy," he said in March. "We are ideally prepared for the future with our strategic roadmap and a well-filled development pipeline."